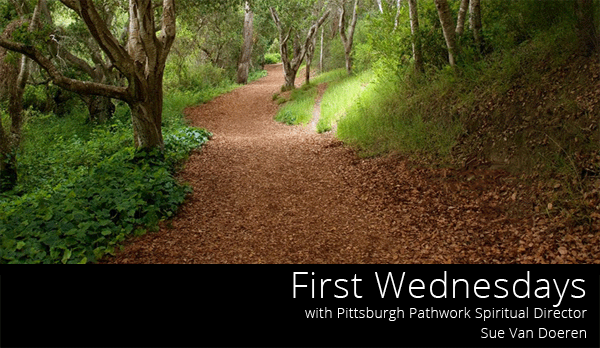 First Wednesdays Starts Oct. 1, 2014! I can only be happy if ______________. If you are interested in having more self confidence, you won’t want to miss this free lecture! We are excited to be starting this year’s First Wednesday lecture series “Self Awareness” starting October 1, 2014! This first lecture is about Self Confidence, and it is terrific. Please note that you do not have to have any background in Pathwork to attend, and you can come to any one lecture or all of them. The only “prerequisite” is that you have a passion to grow! These free lectures are all led by Sue Van Doeren, the Spiritual Director for Pittsburgh Pathwork. Sue is renown throughout the Pathwork community as a powerful, grounded, sourceful teacher and Pathwork Helper. We are so lucky to have her here in Pittsburgh – and to be able to invite our friends to attend her masterful teachings around the Pathwork principles. Click here to download the full lecture. Click here to download Barb Fotta’s one page summary of this lecture. You are not required to read the lecture to receive important learnings. However, you will receive even more if you study the lecture and participate in the homework assignment. For homework (also optional!) write in your journal your response to the following quote: “I can only be truly happy if ______” and fill in the blank. Looking forward to seeing you on October 1. We will have flyers ready for you that list the lectures for the whole year and for you to pass out to people you would like to invite to join us. Chrysanthemums are replacing the petunias at the farmers’ markets, and the open-aired bins are filled with brightly-colored, plump tomatoes, peppers, eggplant and the sweetest of fresh corn. The time of ripening and unfolding is at hand. Through the connection with the sun, the soil and the water – the rhythms of creation, life has unfolded and ripened naturally. We didn’t make that unfolding happen. We couldn’t make it happen. Given the right conditions, the right nourishment, the miraculous process unfolded on its own. We cannot make ourselves ripen and unfold either. We can, however, open ourselves up to be nourished by the background animating presence of life that surrounds and is within us and will ripen our souls with the same natural rhythms. Problems arise when we pridefully think that we are on our own here and it is all up to us to make it happen. We become so engaged in the pursuit of worldly comfort, safety, security and spinning in our problems that we lose sight of the natural rhythm to our own lives … that we are a part of a Divine universe that wants to nourish, heal, ripen and unfold us. We easily lose sight of the vital goodness that surrounds, and is within, us and wants to give to us as the sun and the soil give life to the unfolding of the plants. The Divine is at hand … is close, nearby and within our own hearts … right here with us now, lovingly and patiently waiting for our reaching, our asking, our seeking. The Divine’s animating presence is in all matters trying to use everything, no matter how dark and ugly, to bring us into consciousness and into truth … to teach us about the ultimate reality of love, compassion, justice, tenderness and mercy. We must step with faith into the same infinite mystery as do the plants as they turn their leaves to the sun, sink their roots into the soil, absorb the sustenance of the wet earth to unfold themselves and fulfill on their purpose. We must sink our roots into the Divine and lift our innermost selves to the light within and without so that, just as the plants take a bath in the grace of nature, we can take a bath in the grace of the Divine that is right here with us now. Recall a time when you felt profoundly loving, when you felt open-hearted joy for no reason, when you wept for the cause of justice and the pain of injustice in the world, when you grieved for someone else’s loss, when a sweet tenderness rose up in you that almost took your breath away. Recall a time when you felt moved, when you threw yourself into a situation with abandon because the need was great, a time when you stood up for the truth of love and justice when it was risky to do so. These are moments of the animated presence of the Divine within you, within us, longing for a connection with us. It never leaves us although we leave and lose access to it and separate from it because of the negative condition of being human. Being pathetically human never disqualifies us from reaching for that place of goodness of Divinity within us, and without, again and again. Let us search out and connect with this exquisitely loving, compassionate flow so that we can be nourished into the unfolding and ripening that is our heart’s deepest yearning. Prayer: Great Spirit. We know you are here with us now … in every breath we take, every tear we shed, every upheaval we suffer. May we repent again and again, and yes, again, by turning away from the negativity that has us be human, toward your light, your holiness, which flows in the background of our lives as certain as the redness of the plump ripened tomatoes and the sweetness of the fresh, yellow corn. Amen.